Like my Thing twart, this was just supposed to be a digital rough, but it's suddenly the end of the week, so now it's my final. The idea was to try out Mr. Bretweiser's process of printing out the digital sketch in blueline and then inking it. And I still want to try that. But right now I figure it's probably more important just to get something up so I don't look like a total deadbeat on my own week to pick the theme. Looking at it now, I see that I've just totally forgotten to draw Snowy in there. Also, it occurs to me that this piece is pretty much exactly the same as my Rocketeer twart. I think it turned out great. Its got great color, a great camera angle, and an original take on the character. "Sasquatch wiener!" 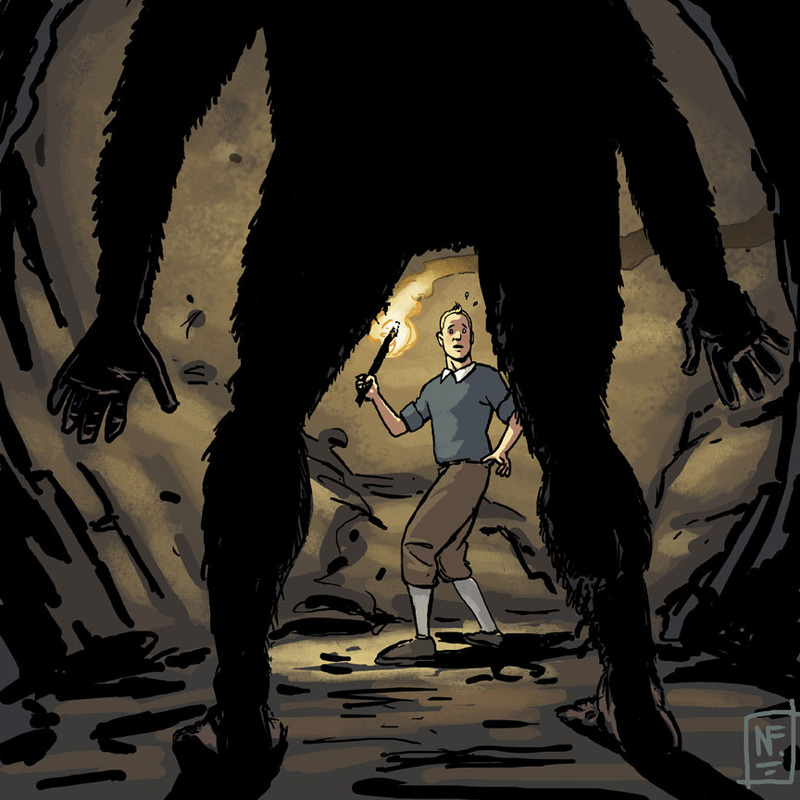 is what I imagine Tintin is exlaiming in surprise there. I love this Nathan, the way you've rendered Tintin makes me think it's Dean Venture in a Halloween costume in like the best episode of Venture Brothers ever! Kudos for bringing your fantastic color work into it too! Do more of that! Fantastic lighting Nathan, and a great turnaround. Nice pick this week! This is beautiful, Nathan. I don't think you need to make any changes to this one. Mitch: you are now the 117th person to indirectly or directly point out to me that I should probably check out this 'Venture Brothers" televisual program. Is good, huh?